Michelle Thomas has joined the team as sales consultant and Kayley Chalk as recruitment consultant. The new appointments marked the end of a hugely successful 2013 which has seen the company expand, launch its new branding, hold a very successful corporate charity fundraising event at Ickworth, and win a number of new accolades. The company was recently accredited to become a member of the Institute of Recruiters and became an ALP agency labour provider after meeting strict criteria. 1st Stop Recruitment is also expanding into recruiting for the food processing and packaging sector after successfully attaining its GLA Gangmasters Licence after a strict assessment process. 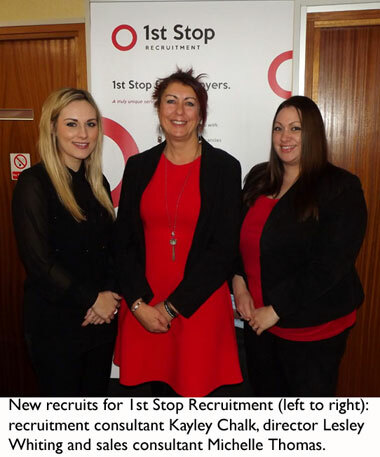 Lesley Whiting, director of 1st Stop Recruitment, said: “2013 has been a an incredibly successful year for 1st Stop Recruitment and with the addition of Michelle and Kayley our future is very bright. “As well as pushing the business forward at a time when many businesses are sadly struggling, our staff have also given back to the community by raising funds for the Dame Kelly Holmes Trust through our charity event at Ickworth, helped the Haverhill Foodbank and the Essex Care Consortium’s residential care home in Colchester. “We have been very much part of Haverhill’s community for many years with long standing relationships with firms here.